After making that chocolate silk pie recently, I had some extra chocolate wafer cookies on hand. 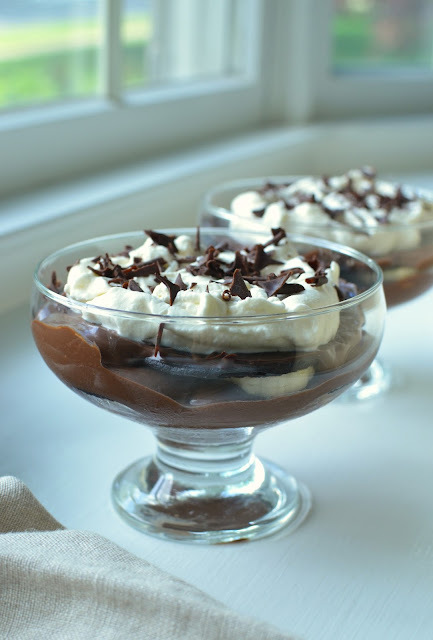 I decided to put them to use for a couple of these chocolate banana puddings. Unlike classic banana pudding, where slices of bananas are layered with vanilla pudding and Nilla wafers, this one has chocolate pudding and those thin "Famous" chocolate wafer cookies. 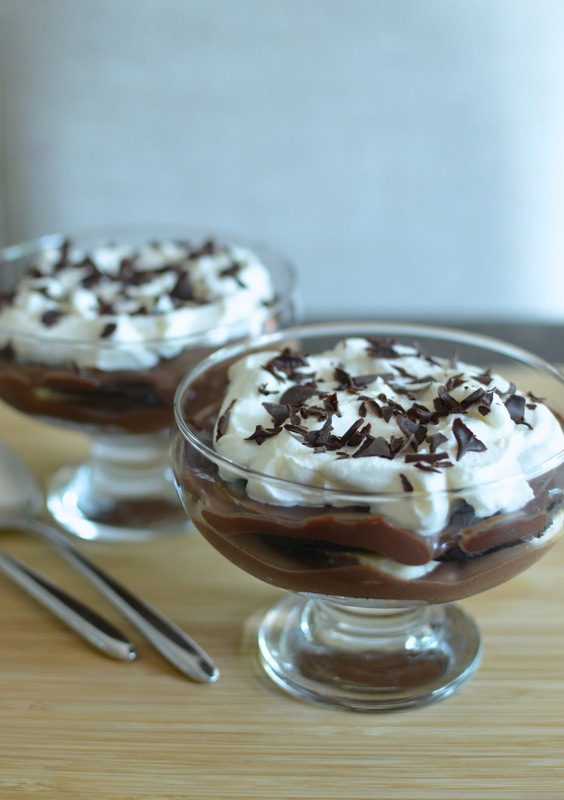 I started by making a relatively simple chocolate pudding, using semi-sweet chocolate. Once the pudding's done, it's quick and easy to put the chocolate banana puddings together. I made two individual servings but feel free to double the recipe I've listed and layer it into an 8-inch serving dish to serve family-style. In my case, I started by spooning a layer of pudding into a serving glass, followed by a layer of thinly sliced bananas, then the chocolate wafer cookies. I repeated the pattern one more time and topped it with a final spread of chocolate pudding. After that, I stored the chocolate banana puddings in the refrigerator overnight. Before serving, I topped them with some freshly whipped cream and chocolate shavings. My oh my, they were delicious! I now know why these thin chocolate wafer cookies exist - they magically transform from crisp, dry cookies into soft, moist cake. What a great shortcut! And as I took a bite and sampled it, I kept thinking it reminded me of something - something very good. Then I realized...it was like our favorite banana bread with chocolate chips, which is a very good thing, indeed! So if any of these words trigger a happy response from you - chocolate, pudding, cake, banana, cool, creamy... - I highly recommend you give this one a try! I started with Melissa Clark's milk chocolate banana pudding recipe from The New York Times and made a few tweaks. In essence, you need to start by making the chocolate pudding. You'll be done within 15 minutes and then you can assemble the rest very quickly. I used these wide ice-cream bowls for my puddings but you can make them any size you like. Just spread each component (pudding, bananas, cookies) in a single layer and go for it. Where necessary, I broke the cookies to fit into the bowl. And I decided to make 2 layers, ending with a final layer of pudding on top. Somehow, just one layer didn't seem enough! That said, it depends somewhat on the serving container. If you use smaller, narrower serving glasses, for example, it would be perfectly lovely to have a single layer of: pudding, bananas, cookies, pudding. I recommend letting the assembled chocolate banana puddings sit in the fridge overnight so that the cookies have ample time to thoroughly soften. You'll be rewarded with ultra-moist chocolate cake layers once the cookies have had the chance to absorb the moisture from the pudding and meld down. I don't know which is better - "classic" banana pudding or this one. As a person who looks for and considers a chocolate version for nearly every dessert she encounters, I'd go for the chocolate. My somewhat less-biased husband just can't decide. Good thing we can make both and alternate! Place chocolate into a heatproof bowl. In another bowl, sift sugar, cocoa, cornstarch, and salt together; whisk in egg yolk and 1/4 cup of the milk until smooth. In a saucepan over medium-high heat, bring remaining 1/2 cup milk and 1/4 cup heavy cream to a simmer. Pour over the chopped chocolate and whisk until smooth. Whisking constantly, pour the chocolate mixture into the egg mixture until completely incorporated. Scrape the custard back into the saucepan and cook, over medium-low heat, until thickened, about 5-8 minutes. Do not let mixture simmer/get too hot; if necessary, take the pan off the heat and stir it a moment before returning it back to the stovetop. Strain pudding through a fine mesh sieve and stir in the vanilla extract. To assemble, place a couple of spoonfuls of pudding into the bottom of your serving dish. Top with an even layer of bananas, then arrange a single layer of cookies on top (break cookies and nudge them in to fit, if needed). Repeat again, then top with a final layer of pudding. Cover with plastic wrap (I press it right onto the surface of the pudding) and chill overnight, or at least 3 hours. When ready to serve, top with whipped cream and a sprinkle of chocolate shavings or crushed cookies. Love that you made just 2 servings, most of the time it is my husband and I. This pudding reminds me of a pie I had once long ago, one that I absolutely adored. Will also be checking out the chocolate wafer cookies on there on as well. Beautiful dessert Monica!! 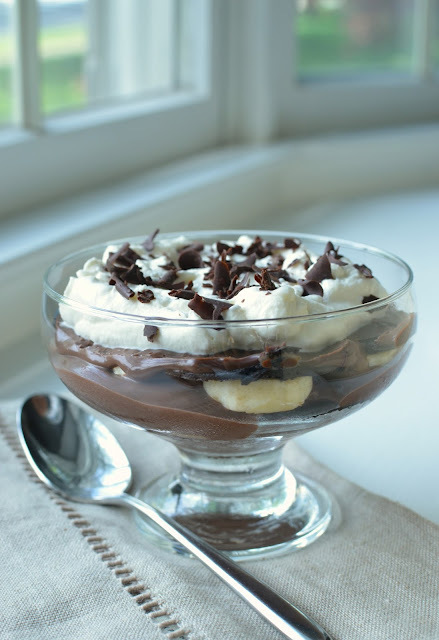 I have never made a chocolate banana pudding..this looks really tempting, Monica. I hadn't until now and I really like it! You must have super human willpower,Monica! I would be so tempted to eat homemade chocolate pudding immediately, and forget the recipe. I would need to double the pudding, so that I could eat some the first day while assembling the layers, to tide me over until the chocolate banana pudding is ready the next day. :) What a luscious cold treat! This is awesome! Banana pudding is one of my favorite desserts! And of course, I can't live without chocolate. I can't believe I have never thought of combining both! Looks amazing, Monica! I had been curious about a chocolate banana pudding for a long time...though it wasn't even very long ago that I had "regular" banana pudding. This is quite tasty...I think you'd like it! Thank you very much...appreciate it! These are SO pretty, Monica! Love how creamy and delicious they look! The chocolate and banana combo sound perfect! Thanks, Kelly. I finally had the chocolate wafers on hand to make these...been wanting to for a while. Hope you are enjoying the summer! Thanks - it was like our favorite banana bread...yum! These puddings look like the perfect way to kick off a Friday!! Happy almost weekend Monica!! Yum! The pudding sounds delightful; I love that the pudding softens the wafers into cake-like deliciousness. Kind of like how ladyfingers in a tiramisu softens into delicious cake (: Thanks for sharing the recipe, Monica! Ooooh yes please! These look amazing, a perfect pudding in hot weather. You made a good use of the wafers. I am loving this chocolate pudding. I'm glad I put the wafers to good use (they were pricey! : ) and now I want to buy another box to make an icebox cake. Don't think I'll have time with so much going on but these puddings were great! OMG! Its breakfast time over here and I wish I could dig into them with a big spoon. Love the recipe. I think chocolate and banana bring out the best in each other. Chocolate does that to everything I suppose and this one is a winner! They were so good! Thank you, Sonali. I love those wafers and a silky chocolate pudding but this is brilliant to be served with the sliced bananas! So pretty too. Hope you had a lovely weekend. Thanks - it was yummy.